The theory of the commodity is used by critical theorists to explain the general organization and development of capitalist society. It was originally proposed by Marx, and subsequently developed by Lukacs and later Adorno and the Frankfurt School. Media scholars such as Dallas Smythe, Judith Williamson, Robert Goldman and Eileen Meehan have identified the commodity structure in several forms throughout the process of mass communication. 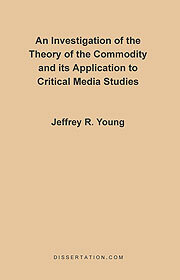 Although commodity theory is not always articulated as a part of critical studies, it is useful for understanding the process of mass communication under capitalism. By investigating the dynamics of market processes and cultural innovation, this paper shows where the theory of the commodity fits into Critical Media Studies and suggests where some productive applications may be found. Dr. Young received a Ph.D. in Comparative Studies from Florida Atlantic University in 2009.